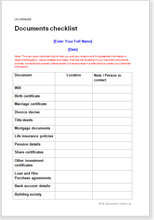 This is an essential document to fill out and leave with your will. May save's in investigation and legal fees if you should die unexpectedly. The document acts as a prompt for you so you can list the location (and other details, passwords, codes and so on) of important documents and other information.